Study 4: Anti-cellulite | EVENSWISS®: a leader of signalling cosmetics. New age in anti-aging beauty care! Body Serum containing Dermatopoietin® or placebo were applied on either the left or right thigh for 8 weeks. Skin structure, in particular the hypodermal – dermal junction distance, by ultrasonography at 20 MHz on day 0, 28 and 56. 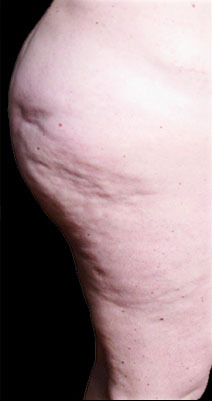 Cellulite skin is characterized by lipid intrusions from the hypodermis into the dermis, resulting in a ‘bumpy’ interface between these two layers and a rough skin surface. 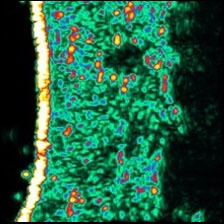 Application of the Serum containing Dermatopoietin® led to a flattening of the dermal-hypodermal interface, a reduction of the lipid ‘blobs’ in the dermis, a more dense dermis and in a smoother skin surface as shown below. Color coding: The stronger and lighter the color the denser the proteins. 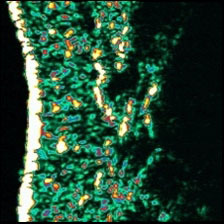 Visible are the layers of keratin in the epidermis (yellow band at left) and of collagen in the dermis (wide green layer). The application of Dermatopoietin® leads to a build-up of collagen in the dermis and a strengthening of the epidermis. 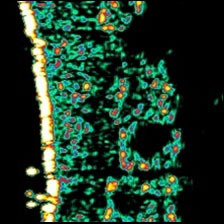 Black pixels represent proteoglycans, lipids and water. A presentation with more detailed information of the study can be found here.